BASF offers advanced cathode materials to allow higher energy density for battery cells and innovative plastics that are UL approved for flammability and engineered to offer protection from environmental elements, and provide opportunities for light weighting. BASF also offers customized electrolytes to meet customer needs. Higher energy density and less weight extend the applicability in aerospace use. BASF offers robust engineering resins that can effectively handle challenging environments, whether there is a need for better stability against glycol exposure, higher exposure temperatures or the need for a flame retardant material. BASF is also focused on weight reduction and has an excellent history of developing new lighter weight technologies based on Ultramid, Ultrason, and polyurethane metal replacement and light weighting applications. This expertise and technology will continue to provide benefits as electrification spreads throughout the transportation industries. BASF has a portfolio of advanced cathode materials to allow higher energy density, improved safety due to a higher temperature stability, and increased efficiency by enabling more discharge/ charge battery cycles. BASF’s HED product family is a cathode active material for lithium-ion batteries. Due to a very high degree of purity and excellent product characteristics, it is well suited for the evolving requirements of batteries in aerospace applications. BASF offers high-purity customized electrolyte formulations that are ideal for aerospace battery applications. 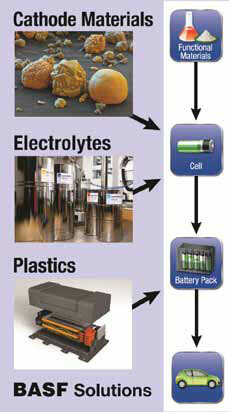 BASF’s Electrolyte Solutions consist of tailored formulations that can be modified to address customer specific needs. Additionally, future generation materials are under investigation within the global R&D network and BASF’s unique position, developing electrolyte and cathode materials in parallel, provides an opportunity to supply system solutions in the future. BASF is one of two licensed cathode suppliers of the U.S. Department of Energy’s (DOE) Argonne National Laboratory-patented NCM cathode material, which employs a unique combination of lithium and manganese-rich mixed metal oxides. The license covers the broadest scope of NCM chemistry, which can be used in today’s lithium-ion batteries. This includes lithium stabilization of known NCM materials, such as 111, 424, and 523, which improves power characteristics, cycle life and safety of current lithium-ion technology. ​Efficient energy production and reduced energy consumption not only contribute substantially to climate protection, they are also in BASF’s economic interest. BASF invests over €400 million per year in research and development for products and technologies for energy efficiency, climate protection, resource conservation and renewable raw materials. Electric mobility is one of those future technologies: local and global emissions will be reduced and overall energy efficiency will increase. ​One factor slowing down market adoption of battery-powered vehicles is the relatively short transport range associated with low energy density batteries. New generations of cathode materials, which are key to the performance and safety of batteries, provide much higher energy density, enabling increased driving distances for full electric, plug-in, or hybrid vehicles. In addition, saving weight in the battery pack through the replacement of metal with plastics can also improve range.